End of Month Sales – January! Towards the end of January, stores are trying to liquidate old merchandise to make room for Valentine’s and Spring items. In store and website clearance sales range from 50-75%. MDM loves the 75% sales. Be sure to check the following: Target [in store]. 50-75% off selected men’s wear that includes boxer shorts, jackets, flannel pjs, kahki slacks, shirts and socks. Also, peruse the perfume aisle for great deals on perfume box sets that are 75% off the store’s initial price. Check out handbags that are 50% off. Selected furniture items are at 30% markdowns, not a huge markdown, but are limited. MDM advises to use your own discretion as to buy or wait for further price reduction. Macy’s. Macy’s is having a blowout sale on clearance items, taking an additional 25% off clearance for markdowns up to 70%. Shipping and handling is99cents per item, just include 99CENTS in the promo code (ends 01/28/06). Check out the cotton Overdrive long skirts and shrugs for that bohemian, peasant look at super savings. Cost Cutters [in store and online]. In store: Cost Cutters is re-styling its name brand hair products, resulting in a 40% markdown on its present stock. Many of Cost Cutters hair products are equivalent to Paul Mitchell and Samy Salon. Be sure to stock up on this great hair product deal. Supplies are limited. Furthermore, Cost Cutters is having its liter sale on Back to Basics shampoos and conditioners. A good buy is the Cost Cutters Style Plus Card for $1, which will save you money on hair cuts, services, and products. Online: Cost Cutters new styling products are in and being offered as a buy one, get one for 50% off. Gift cards are also offered on CC’s webpage. Fashion Bug. Fashion Bug features latest women styles for girls, juniors and plus sizes. Styles include those for young and older women. FB is having a winter 60% meltdown sale to make room for its new Spring collection. MDM suggests looking at the clearance items as the greatest deals are found here and often account for 70-75% markdowns. Be sure to check out the cheetah inspired blazer in the plus size clearance. This is one hot item! In spiegel’s recent catalogue, the online store features a similar item for ages 20-40. This creates great professional looking attire with a black camisole and black pin tucked slacks. Furthermore, start shopping in the sweaters section for the remainder of the winter and for the following year. Quantities are limited. Update 01/22/06 Macy’s. Your best deals are online, but limited. Instore checking found many real bargains sold out. Deb’s [instore]. 60% sale on winter apparel. Selected clearance includes an additionall 25% off. Nordstrom’s Rack. $$$Expensive even though there are items with 60% off. A woman’s tuxedo blazer in sizes to 4X, orig. $325, now $125. Eddie Bauer. 30% off $50.00 jeans. Wesbsite sales better than instore. Update 01/26/06 Kohls. Up to 80% off retail clearance begins Thursday, January 26. Very limited stock. Free shipping on merchandise total of $75 or more enter “WINTER” promo code. Update 01/28/06 Coldwater Creek. Super savings at this site, click on “Outlet” listing. MDM especially liked the markdowns on shoes, up to 80%+ off. Also check “Weekly Specials,” everything is $9.99, but hurry sale ends on Sunday! Update 01/29/06 TJMaxx [instore]. Up to 70% off department and specialty store prices. Check out kids’ designer clothing. Sale starts today. Kohls[instore] Up to 80% off sale. Kohl’s also packs additional inventory in their stores for this sale, be sure to check merchandise out. Update 01/31/06 JCrew. Check out the “sale” listing at JCrew. 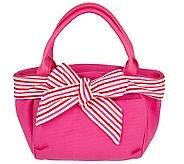 MDM found up to 70% off, e.g. dresses reg. $350, now $99!